Joshua Bailey has been writing articles since 2006 with work appearing at Bodybuilding.com and 2athletes.com. Bailey holds the following certifications: NASM-CPT, NASM-PES, NASM-CES and NSCA-CSCS. He also holds a Bachelor of Science in exercise and sports science from the University of North Carolina, Chapel Hill and a Master of Science in exercise physiology from the University of North Carolina, Greensboro. 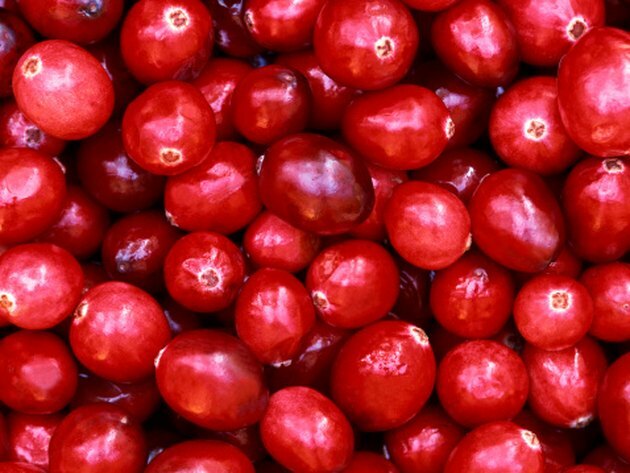 Cranberries are a tart fruit with a subtly sweet taste. Additionally, they are full of antioxidants that help prevent cancer and contain proanthocyanidins, which help combat bacteria associated with urinary tract infections. 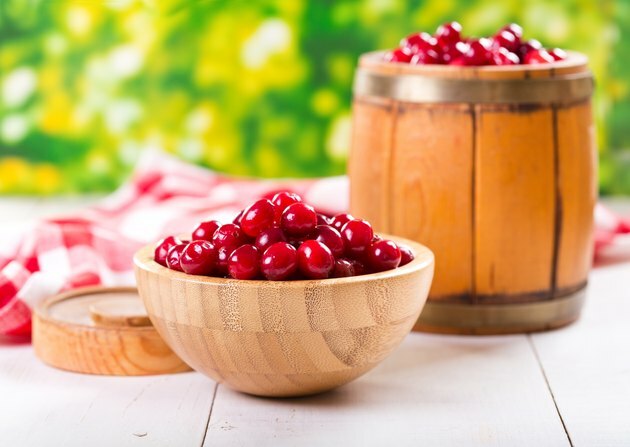 Since the cranberry fruit is so tart, however, some people struggle to eat the pure fruit, which prevents them from enjoying their health benefits. By juicing the berry, you can alter its flavor profile to make it less sour. You also control what you put into the juice and can eliminate unnecessary additives that are typically found in store-bought cranberry juices. Wash the cranberries and place them into a colander to dry. Place the clean berries into a large bowl. Crush the berries with a small cooking mallet by simply pushing down on the berries to break them open. You can also use a juicer, blender or another device to puree the cranberries. Doing so will allow you to get more juice out of the berries; however, you may need to add more sugar to the recipe to compensate for the added tartness. Squeeze the juice of one lemon into the mixing bowl with the crushed cranberries. Pour ½ cup sugar into the mixing bowl. Allow the berries to rest for 30 minutes; during this time, the berries will macerate and break down. Pour the macerated mixture into a large cooking pot. Place the pot onto the stove over medium heat for 10 to 15 minutes. During this time, taste the resulting liquid and adjust the flavor profile for the juice. You can add more sugar or other types of fruit to taste to increase the juice's sweetness and reduce its tart flavor. Remove the pot from the stovetop and cool the mixture for 30 minutes. Place a cooking sieve lined with cheesecloth over a large bowl and pour the cooked mixture into the sieve. Allow the juice to separate from the solids. The juice will drip into the bowl while any solid fruit will be separated from the juice by the sieve and cheesecloth. Pour the juice into a refrigerator-safe container and allow it to chill. The leftover remnants of cranberry that are captured in the sieve can be recooked to release any leftover liquid left in the berries. Do Any Fruits Lighten Skin Tone? What Is a Serving Size of Blueberries?